FAQ: Do you sell motorized blinds, shades, drapes in Regina? Our Regina regional office sells motorized blinds and shades (and motors for curtains, drapery and window/skylight openers) all across Canada, including Saskatchewan: Regina, Saskatoon, Estevan, Moose Jaw, North Battleford, Prince Albert, Swift Current, Weyburn, Yorkton, etc. You can call on our experienced blinds and shades installation team to install complete shade and drapery systems for you, or you can buy just the motors and do it yourself (DIY). We also have remote control window and skylight openers, and LED lighting systems. Our radio equipped remote control motors use Radio Frequency (RF) to transmit the control signal. A small antenna in the motor receives the signals and a microprocessor decodes the signals to activate the motor. This system is different from the infrared signal (IR) used on most TV sets. 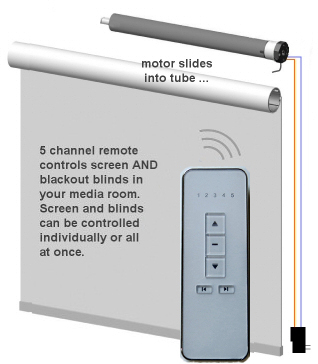 Unlike infrared, the RF signal is not directional - you do not have to point the remote at the roller blinds or shades. For more info, see our multi-channel RF remote control products. We also have sun sensors and timers to control blinds and shades anywhere in a typical home.